A group of alpinists are lending help for adventure tourists. Visitors to Armenia now have more active options to seeing the country. Extreme tourism, geared for more active vacationers that prefer to hike, bike, climb, and more, are contributing to tourism's development in Armenia. 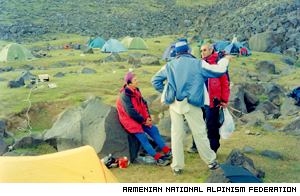 Hayk Tonoyan, President of the Armenian National Alpinism Federation, says, "Today this type of tourism, characterized by physical activity, is being developed throughout the world. The number of people trying to spend their time close to nature increases every year." Armenia is a good place for extreme tourism, and for mountain tourism in particular. In addition to its mountainous landscape, Armenia is developing an infrastructure for alpinist rescuers to ensure tourists' safety. "Tourists arriving to Armenia try to have active rest. They prefer to walk, to climb mountains, but not to take buses to Garni and Geghard," Tonoyan says. The idea of introducing extreme tourism was the federation's. A search and rescue plan was in place, but the organization lacked the funds to implement it. Tonoyan's group got a $100,000 grant, to be shared with other specialists of the sort in Georgia and Azerbaijan. The Alpinist's Federation is armed with modern technology. They work using a GPS satellite system, making it possible to find a person's exact location within one meter. Alpinists are being trained and informed about the latest technologies, and maps are being digitalized as part of the project, according to Tonoyan. Explorers can take one of four tracking devices and have their movement monitored by Tonoyan's group in Yerevan. Should an emergency arise, the rescuers would know where to find the group in trouble. This summer the service is being offered free and has already been used by groups of Czech and French tourists. The rugged Armenia terrain welcomes exploration. Tonoyan thinks this service is very important and improves Armenia's reputation. This is the only region of the CIS where this kind of system operates. Eleven tourist routes over the entire territory of Armenia were included in the framework of the program. Aragatsotn, Znagezur and the Ghegama Chain of Mountains are focused on more than others. And one route can take from two days to one week. Tonoyan assures that routes were worked out in detail, including the map digitalization. All dangerous and difficult to traverse places were taken into account. 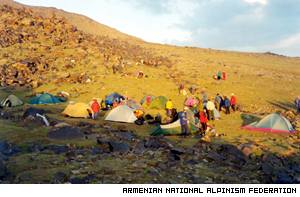 Interesting sites for appreciating Armenian nature were also included in the routes. Phase Two of the project, which will focus on virtual tourism, will next be put into practice. "A tourist will see the computers video clip of the route he chooses. He will get to know where he is going and what he will see. He will be able to make right decision after he sees the real route," Tonoyan admits. Implementation of the second phase of the program requires the use of satellite phone connections, enabling tourists to place calls from anywhere. "Cultural tourism is good, of course, but extreme tourism is more interesting. People got tired of civilization and prefer to have active rest close to nature," Tonoyan says.